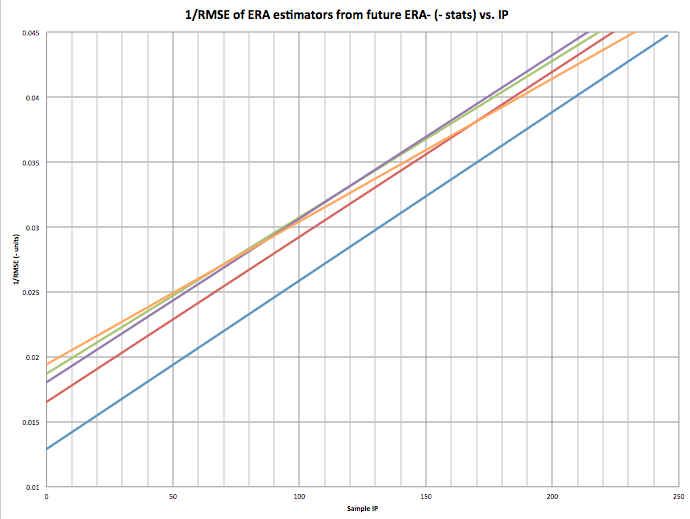 FIP, xFIP, and SIERA are all very good ERA estimators, and their predictability is well documented. It is well known that SIERA is the best ERA estimator over samples that occur from season to season, followed very close by xFIP, with FIP lagging behind. FIP is best at showing actual performance though, because is uses all real events (K, BB, HR). Skill is commonly best attributed to either xFIP or SIERA. ERA is also well known to be the worst metric at predicting future performance, unless the sample size is very large <500IP with the pitcher remaining in the same or a very similar pitching environment. FIP, xFIP, and SIERA are supposed to be Defense Independent Metrics, and they are. Well, they are independent of field defense, but there is one small error in the claim of defense independent. K’s and BB’s are not completely independent of defense. Catcher pitch framing plays a role in K’s and BB’s. Catchers can be good or bad at changing balls into strikes and this affects K’s and BB’s. Umpire randomness and umpire bias also play a role in K’s and BB’s. It is unknown how much of getting umpires to call more strikes is a skill for a pitcher or not. Some pitchers are consistent at getting more strike calls (Buehrle, Janssen) or less strike calls (Dickey, Delabar), but for most pitchers it is very random (especially in small sample sizes). For example Jason Grilli was in the top 5% in 2013 but was in bottom 10% in 2012. The stats with very little to absolutely no correlation (R^2<0.01) were: Z-Swing%, Zone%, OSC%, ZSC%, ZL% (was a bit surprised as this would/should be looking strike%), GB%, and FB%. These guys are obviously a no-no to include in my estimator. The stats with little correlation (R^2<0.1) were: Swing%, LD%, and IFFB%. I shouldn’t use these either. O-Contact% (0.17), Z-Contact%, (.302), Contact% (.319), OSM% (0.206), and ZSM% (.248) are all obviously directly related to SwStr%. SwStr% had the highest correlation (.345) out of any of these stats. There is obviously no need to include all of the sub stats when I can just use SwStr%. SwStr% will be used in my metric. OL% (0.105) is an obvious component of O-Swing% (0.192). O-Swing had the second highest correlation of the metrics (other than the components of SwStr%). I will use it as well. The theory behind using O-Swing% is that when the batter doesn’t swing it should almost always be a ball (which is bad), but when the batter swings, there are a two outcomes, a swing and miss (which is a for sure strike) or contact. Intuitively, you could say that contact on pitches outside the zone is not as harmful to pitchers as pitches inside the zone, as the batter should get worse contact. This is partially supported in the lower R^2 for O-Contact% to Z-Contact%. It is more harmful for a pitcher to have a batter make contact on a pitch in the zone, than a pitch out of the zone. This is why O-Swing is important and I will use it. Using just SwStr% and O-Swing%, I came up with a formula to estimate (with the help of Excel) ERA-. I ran this formula through different samples and different tests, but it just didn’t come up with the results I was looking for. The standard deviation was way too small compared to the other estimators, and the root mean square error was just not good enough for predicting future ERA-. I did not expect/want this estimator to be more predictive than xFIP or SIERA. This is because xFIP and SIERA have more environmental impacts in them that remain fairly constant. K% is always a better predictor of future K% than any xK% that you can come up with. Same with BB% Why? Probably because the environment of catcher framing, and umpire bias remain somewhat constant. Also (just speculation) pitchers who have good control can throw a pitch well out of the zone when they are ahead in the count, just to try and get the batter to swing or to “set-up” a pitch. They would get minus points for this from O-Swing, depending on how far the pitch is off the plate, but it may not affect their K% or BB% if they come back and still strike out the batter. So I didn’t expect my statistic to be more predictive, but the standard deviation coupled with not that great of RMSE (was still better than ERA and FIP with a min of 40IP), caused me to be unhappy with my stat. I then started to think about if there were any stats that were only dependent on the reaction between batter an pitcher that are skill based that FanGraphs does not have readily available? I started thinking about foul balls and wondered if foul ball rates were skill based and if they were related to ERA-. I then calculated the number of foul balls that each pitcher had induced. To find this I subtracted BIP (balls in play or FB+GB+LD+BU) from contacts (Contact%*Swing%*Pitches). This gave me the number of fouls. I then calculated the rates of fouls/pitch and foul/contacts and compared these to ERA-. Foul/Contact or what I’m calling Foul%, had an R^2 of .239. That’s 2nd to only SwStr%. This got me excited, but I needed to know if Foul% is skill based and see what else it correlates with. This article from 2008 gave me some insight into Foul%. Foul% correlates well to K% (obviously) and to BB% (negative relationship), since a foul is a strike. Foul% had some correlation to SwStr%, this is good as it means pitchers who are good at getting whiffs are also usually good at getting fouls. Foul% also had some correlation to FB% and GB%. The more fouls you give up, the more fly balls you give up (and less GB). This doesn’t matter however, as GB% and FB% had no correlation to ERA-. Foul% is also fairly repeatable year to year as evidenced in the article, so it is a skill. I will come up with a new estimator that includes Foul% as well. I decided to use O-Looking% instead of O-Swing%, just to get a value that has a positive relationship to ERA (more O-looking means higher ERA), because SwStr% and O-Swing are negatively related. O-Looking is just the opposite of O-Swing and is calculated as (1 – O-Swing%). C is a constant that changes from year to year to adjust to the ERA scale (to make an average TIPS = average ERA). For 2013 this constant was 2.57. I converted this to TIPS- to better analyze the statistic. FIP, xFIP, and SIERA were also converted to FIP-, xFIP-, and SIERA-. I took all pitchers’ seasons from 2008-2013 to analyze. The sample varied in IP from 0.1 IP to 253 IP. I found the following season’s ERA- for each pitcher if they pitched more than 20 IP the next year and eliminated any huge outliers. Here were the results with no min IP. RMSE is root mean square error (smaller is better), AVG is the average difference (smaller is better), R^2 is correlation (larger is better), and SD is the standard deviation. Wow TIPS- beats everyone! But why? Most likely because I have included small samples and TIPS- is based off per pitch, as opposed to per batter (SIERA) or per inning (xFIP and FIP). There are far more pitches than AB or IP so TIPS will stabilize very fast. Let’s eliminate small sample sizes and look again. Now, TIPS is beaten out by xFIP and SIERA, but beats ERA and and is close to FIP (wins in RMSE, loses in R^2). This is what I expected, as I explained earlier K% and BB% are always better at predicting future K% and BB% and they are included in SIERA and xFIP. SIERA and xFIP take more concrete events (K, BB, GB) than TIPS. I didn’t want to beat these estimators, but instead wanted a estimator that is independent of everything except for pitcher-batter reaction. TIPS won when there was no IP limit, so it obviously is the best to use in smaller sample sizes, but when is it better than xFIP and SIERA, and where does it start falling behind? I plotted the RMSE for my entire sample at each IP. Theoretically this should be an inverse relationship. After 150 IP it gets a bit iffy, as most of my sample is less than 100 IP. I’m more interested in IP under 100 anyhow. 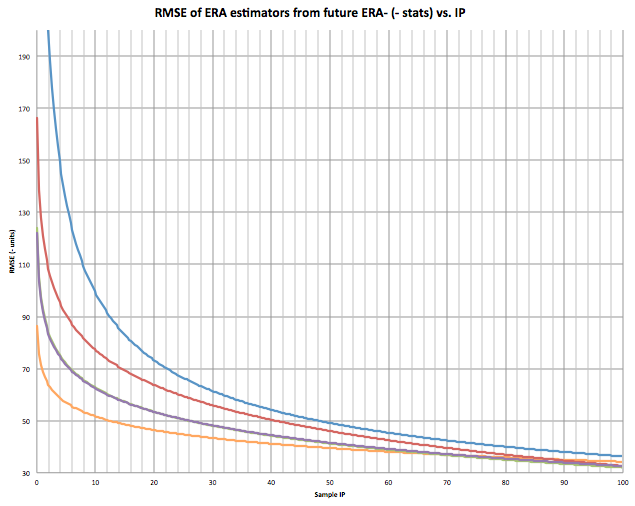 Looking at the graph, at what IPs is TIPS better than predicting future ERA than xFIP and SIERA? It appears to be from 0 IP to around 70 IP. Here is the graph for 1/RMSE (higher R^2). Higher number is better. This is the most accurate graph as the relationship should be inverse. The 70-80 IP mark is clear here as well. I’m not suggesting my estimator is better than xFIP or SIERA, it isn’t in samples over 75 IP, but I think it is, and can be, a very powerful tool. Most bullpen pitchers stay under 75 IP in a season. This means that TIPS would be very useful for bullpen arms in predicting future ERA. I also believe and feel that my estimator is a very good indicator of the raw skill of a pitcher. It would probably be even more predictive if we had robo-umps that eliminated umpire bias and randomness and pitch framing. 2013 TIPS Leaders with 100+IP. You can scroll horizontally, search for a specific player, and adjust number shown. Well done, though I’m unsure where, as you say, catcher framing is removed from this. Couldn’t O-Looking% be affected by this? No O-Looking% is different than ball%. These are pitches that are outside the zone as determined by PitchF/X. Whether the pitch is called a strike or a ball is irrelevant. This is therefore independent of framing and umpire calls. PitchF/X uses various camera angles to determine where the ball actually crossed the plate. PitchF/X is not fooled by the Molina brothers’ ridiculous framing skills as umpires are. One example is David Price, he is generally caught by Jose Molina (known as a top 3 framer, if not the best) and Jose Lobaton (also an above average framer). TIPS believes Price showed merely average (or even below) skill this year, where as ERA, FIP, xFIP, and SIERA show Price as ace quality. Second, could you post the 0-30 IP results? TIPS is still roughly as accurate (RMSE) as FIP over that range. It could be of some use/interest. Thanks, and yes I can add the 0-30 IP when I have time. I am also going to post leaderboards for previous years soon as well. Also did you look at any differences between pitchers used as starters and relievers? Obviously, you already did a lot of work, but that might be interesting as well, as well as lefty/righty. Would love to see you test TIPS against the various other run estimators using only pitchers who switch teams (to completely take park and defense out of the equation). I couldn’t follow from the article whether you tested out-of-sample or in-sample… Did you use the same data for the regression that produced the formula and for evaluating its performance against FIP, xFIP and SIERA (all pitchers, 2008-2013)? Or did you use a different data set for doing the regression? Data set was completely independent of test data sample. MGL, I ran that last night and it provided similar results. Will post it sometime soon. filihok, I decided to not use starting IP or relieving IP in the formula. If relievers see boosts due to being able to throw with all of their velocity at once, it should show up in the data. Cool on the in-sample/out-of-sample. What was the in-sample data? Did you reserve certain pitchers? Since you tested 2008-2013 I assume you didn’t reserve any specific years. No, all pitchers from every year, regardless of IP, were tested against the next year IP provided they pitched at least 20 inning the next year. For creating the formula, I used pitchers “career” stats from 2008-2013 who pitched at least 300 innings in that span. I used 300 IP to ensure I had bullpen arms in the sample. That’s not really an independent sample then. You estimate 2009’s ERA based on 2008’s pitch stats, but the formula was derived using data from both seasons. In other words, the formula has been fit to the same pitchers over the same period that you’re testing. Whereas FIP hasn’t been adjusted retroactively to provide the best fit for the specific years 2008-2013, other than the adjustment of the constant. I assume the same is true of SIERA and xFIP. I see what you are saying, but it’s not like I had much of an option. PitchF/x data was only available 6 years ago. It is also over a span of 6 years, and the testing is year to year. Correct me if I’m wrong, but wouldn’t that be more of an issue in larger samples (not my niche of 0-70 IP)? I also didn’t use 2007 data, can I run the tests and get back to you for the predictability of 2007-2008? This should be more of the independence you are looking for. TIPS can also be tested after this year as well. 2007 data might be kind of screwy. One thing you could do is redo the regression based on 2008-2012, and use the new coefficients to evaluate 2013. It’s entirely possible the formula will come out about the same and the predictive value for 2013 will remain – I’m not trying to poopoo the concept. I will do this and get back to you! This resulted in 7o – 9.25s -4.8f +2.0. O-looking co went up slightly and SwStr went down slightly. Difference in correlation to sample of this formula and previous TIPS was .0002699. Standard deviation of the formula for 08-12 was noticeably smaller (too small for my liking), but it’s predictability for 2012 to 2013 was slightly better (not significant at all) than TIPS. 41.020 RMSE compared to 41.087 RMSE for TIPS-. A discussion on TangoTiger’s blog is about the same issue, although it looks to be rectified with what I just did. 2008-2012 sample used on 2012 to predict 2013 worked just as well, even slightly better, but with a smaller standard deviation. More years of data would obviously ideal, but with pitchf/x being very recent, this is not possible. I will be actively testing 2013 to 2014 once the season starts and 2014 in season as well. Pretty cool. Casey Janssen’s TIPS caught my eye. More evidence that he should probably be traded. So now I ask the obvious question … why on earth would something be more predictive under 70 IP, but not 70 IP and over? Wouldn’t this indicate simply mashing numbers to try to get a superficially predictive match, and ignoring logic in the process? What, that’s included in the other derived statistics, suddenly gains more importance/relevance to a pitcher’s success/failure as they cross the 70 IP threshold that wasn’t as important/relevant below it? Those are the sorts of questions that need to be posed and answered via peer review before these things get out there and gain footing amongst the masses. “We got a match!” shouldn’t cut it. I’m thinking that what might be likely is that the inputs of TIPS, O-Looking%, SwStr%, and Foul%, simply stabilize quicker than the FIP inputs do. I recall from a piece on BP that pitcher K and BB rates take something like 1/5 and 1/2 of a full season to stabilize (so say 40 IP and 100 IP). I don’t remember how long HR rate takes to stabilize, but it’s probably much longer. So in light of that, the crossover points between TIPS and xFIP at ~70IP and TIPS and FIP at ~170 would make a lot of sense. Past 70 IP, K and BB rates are stable and K and BB rates are stronger indicators of skill than their inputs. And really, I think Chris’ thought process is well outlined so any concerns about “number mashing and ignoring logic in the process” are not warranted here. Yes, it’s due to the denominator of the statistics. SwStr, Foul% and O-Swing% have the a smaller denominator (pitch or contact or o-pitch) than other estimators (IP or PA). This means TIPS stabilizes much faster, and therefore is more predictive that the others. The other estimators use more real events (K, BB, HR) that can be affected by an environment (K, BB). If this environment stays constant (catcher) it is more likely to continue this way. This is why the other estimators are likely more predictive in larger samples.